rec. Townsend Hall, Shipston-on-Stour, England, 26 June and 5 July 2015. John Ireland loved the countryside of the South Downs of West Sussex. They were a constant source of inspiration for him. His A Downland Suite was originally written as a brass band piece for the National Brass Band Championships of Great Britain in 1932. Ireland later arranged the exquisite middle two movements, the ‘Elegy’ and ‘Minuet’ for string orchestra reversing their original order - and realising that they were much more effective as string pieces. Geoffrey Bush arranged the extrovert outer movements, ‘Prelude: Allegro’ and ‘Rondo: Pocco allegro’ respectively. I have to say that I prefer the more heart-warming performance of Richard Hickox and City of London Sinfonia recording from 1996 Chandos CHAN9376 to this new Curtis reading although his Minuet, well-known through many uses as background music for broadcast programmes, is nicely presented. Matthew Forbes, who arranged the Ireland Sonata in G minor for cello and piano, played in the cello section of the Orchestra of the Swan from 2005. This arrangement allows different shades of expression into this lovely music with a broader accompaniment to the cello. Raphael Wallfisch’s refined reading probes deeply into Ireland’s highly emotional, often tormented world. The opening movement roams between the elegiac and the assertively muscular, from passion and yearning to railing defiance. The Poco largamente second movement finds Ireland at his most poignantly, lyrical and Wallfisch and the Swan players reveal all the music’s haunting beauty. The final Con moto marcato is agitated and tormented with whip-like arpeggios and a darkness reminiscent of Hitchcock/Bernard Herrmann in Psycho mood, its restlessness only partially mollified. Graham Parlett’s credentials as a lover and champion of British music (especially that of Bax) is well known. His arrangements of Ireland’s piano pieces here are most appealing. 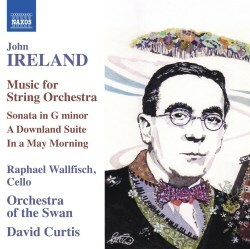 His Summer Evening is a languid and drowsy pastoral evocation, his In A May Morning lyrical and tender and very much in the mood of Ireland’s central ‘Elegy’ of his A Downland Suite – gorgeous. Soliloquy gently meditates and the allusion to Butterworth’s setting has one mindful of the rueful, ghostly Housman poem, Is my team ploughing. The remaining three little pieces are melodic and charming gems; composed in pre-Great War days, they would have been termed then as salon music: the jaunty cheerful Bagatelle, the nostalgic, introspective Berceuse and the lyrical, sentimentally romantic Cavatina. The British Music Society and the John Ireland Trust are to be thanked for supporting such an enterprising album.